We know how I feel about Lush here, don’t we, Fangirls? I’m obsessed and in love. Their products have me raving like a lunatic with excitement. I just want to use them constantly. One of their products, FUN, makes that possible. FUN is a really awesome, sort of bath time play-doh that is purely amazing. First off, is the cause. A percentage of each sale goes to help out with building safe places for kids to play in Japan. Second, it has several uses, so it can be a part of your daily routine, or something that you only use on occasion. So other than using it like play-doh and molding it into shapes, what can you do with FUN? You can shampoo your hair with it. I’m not going to lie, Fangirls, it was a little weird to use FUN as shampoo at first. I’m not used to using solid shampoo, so I wasn’t really sure how to do it. But I found that taking a small amount of FUN, wetting my hands, and rubbing them into a lather made for a delicious smelling head of hair. I was surprised that it didn’t make my hair weird. I’ve got pretty messy curly hair, so I always expect new products to throw a wrench in my routine. Luckily, FUN did not. The only difference was a different way to shampoo, and an amazing scent. You can also use it as a bubble bath. 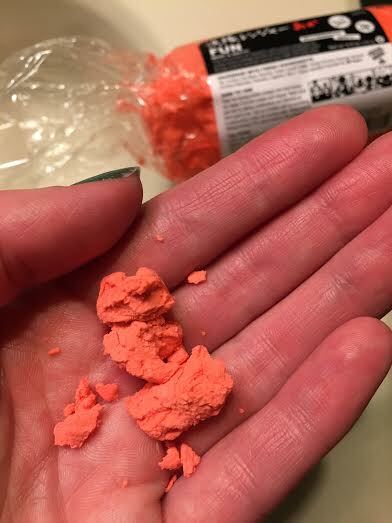 You crumble it into your hands under hot water, and watch bubbles ensue! 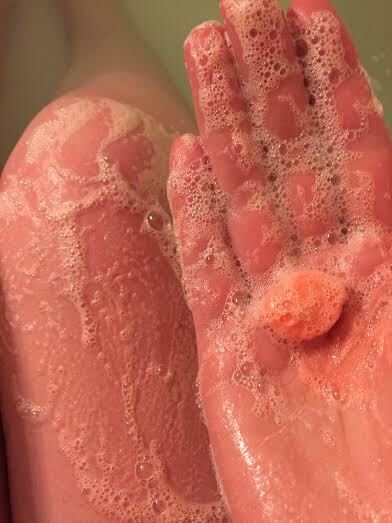 the bubbles aren’t super big, but they are incredibly fresh smelling, and relaxing. 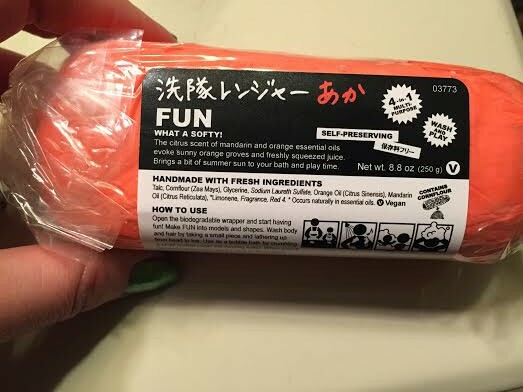 I bought the Red Fun, which has a Mandarin Orange scent, and found it invigorating to use in the day, and still relaxing to smell at night. And if that’s not enough, you can use it as soap too! It’s just all of these awesome things, and for a great cause too! Plus, it made my skin incredibly soft when I used it for bubbles or soap. While I was using my FUN, I found that once wet, it got a little slimy. Be wary of that if you’re planning on taking all of it out to play each time. I tried to break off small pieces to go into the shower or bath with me, so I wouldn’t be wasting it. But since it comes in a big huge tube, it lasted for ages! 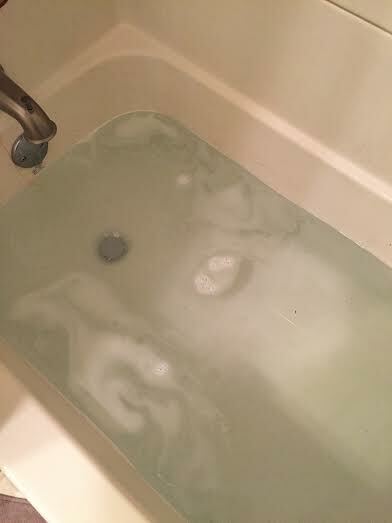 I didn’t use it as my daily soap or shampoo, but when I was in a lull between bath bombs, I used it as my bubble bath, and thought it was really great to have around. Another awesome thing about it’s size and that it’s a malleable solid, is that it’s easy to travel with. When you don’t have to worry about exceeding your allotted liquid for flights, or spillage for any sort of travelling, life is so much easier! I found that it was easy to bring on train rides without having to constantly check to see if my shampoo bottle burst (which always really worries me when I’m going anywhere. Altogether, FUN is an awesome product that everyone should check out at least once, especially you Fangirls with kids! I recommended it to a coworker, and her daughter loved that her soap and bubbles came from cool shapes that she got to make. FUN improves bath and shower time, and makes safe places for kids to play in Japan. So go order some for yourself, or go into your local Lush shop and see what they’ve got!